2007 has been a busy year for travel. Messages for Sam have come from far and wide. Here is a bumper round-up of all the places we have ever had Hi Sam messages from. We’re still stuck on six continents – does no one go to South America these days? Can you help us crack South America so we can complete the list? Please keep sending us your pictures and messages. Sam and family love seeing them (as do we). Find out what is Hi Sam and how you can send us your message. Merry Christmas and a happy 2008 to everyone! London Christmas craft sale and raffle. Sam’s had a busy year too. He’s been to Japan, cycled many many miles on his FES bike and even got a pet dog. We saw the family when they visited us recently and were all looking well. In 2008 we are looking forward buying cool new equipment for Sam and working towards hitting the big £30k, it’s not so far off really! Whether you want to make a donation, send a Hi Sam message from your travels or just leave a comment, we’d love to hear from you. Less than a month has gone by and its time for the old totaliser again! Monies raised came from one donation, some books and the £726 raised by the Christmas sale and raffle at the end of November. Its great to have reached £23k well before the end of the year. We started raising money for Sam back in December 2005 – who’d have thought two years later we would have raised this much!? Splendid stuff – onwards and upwards into 2008! £30,000 here we come! 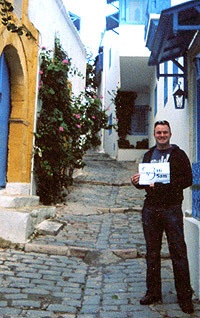 We went to Tunisia on holidays recently, here’s a picture of Chris in the little town of Sidi Bou Said, which is famous for it’s beatiful white buildings with azure blue shutters and wrought iron doors. Unfortunately the weather wasn’t very good so the sky wasn’t the same shade of blue but we warmed up with glasses of mint tea topped with pinenuts, which tastes a lot nicer than it sounds! 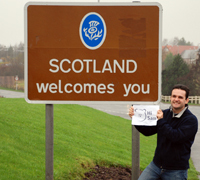 here we are on the border between England and Scotland. We were on holiday in the Lake District and decided to drive an hour north to the edge of England do our message. It was a very very wet day and we couldn’t see much other than cloud! The sign was on a very busy road and lorries beeped at us to say hi as they went past! In Gretna there was an exhibition called Devil’s Porridge but unfortunately it was closed so we couldn’t go in. We had a lovely week of walking, exploring and drinking tea in front of the fire.